Throughout my Biodynamic studies I have found it a constant challenge to fit the myriad of ideas and ‘pictures’ I have been presented with into a cohesive realistic picture. Hence I have continually endeavoured to find the practical or reality based carrier of any concept. One result of this search has been the development of the accompanying diagram. In it I am attempting to base the ‘idea’ of the spiritual bodies presented to us constantly through Rudolf Steiners work in their physical spheres or ‘homes’ and then explore how each sphere or layer is connected to the others. The spiritual bodies, presented as the basic vehicles of manifestation by Steiner, may be a new concept to some members. They are however an important ‘reality’ to understand and ultimately live with if one is fully grasp what is presented to us in ‘Agriculture’. The closest understanding of them we have in our twentieth century western Christian tradition is the Body and Soul. These two groupings can be each divided into two. The Body can be separated into its purely physical carbon based body and a ‘body’ which carries the living, growth aspect of our physical body. Many traditions call this the Etheric body. It is this Etheric body which separates from the physical upon death, which then sees the physical body disintegrate. The christian Soul can be devided into two parts as well. There is the eternal personal spirit where consciousness resides called by Steiner the Ego and then the Astral body which is mostly experienced and understood as our psychology, emotions and psychic experiences. ( I understand in christian theologies the Spirit is reserved for ‘God the father’ or the ‘holy ghost’. I would suggest in Biodynamics this is the Cosmic or Macrocosmic Spirit. ) The difference between the Astral body and the Spirit \ Ego is the difference between the Sun and its planets. The Sun is the generating vortex at the centre of our Solar system. It is out of the Suns activity that the planets come into being. The same is true of the Astral body. It out of the spirits active participation through life that our Astral body – sense impressions, psychological responses, neurosis – are formed. It can be said to ‘orbit’ the Ego. I hope to look further into the four bodies working and influence upon agriculture, and other ideas presented here in future articles. In Biodynamics the sayings ‘As above so below’ and ‘Life is a microcosmic image of the Macrocosm’ takes on the most practical expression I have met so far. We are presented with the picture that these four bodies find their source and ‘homes’ in the macrocosm. Life as expressed in the four kingdoms of nature, – the mineral, plant , animal and human – are bought into form and held there due to an internalisation or personalisation of small parts of these macrocosmic spheres. So we take for our selves a little piece of the Earths matter, a dash of Atmosphere, a hearty slice of the Solar system and a pinch of Galaxy to become who we are. The proportions of this mixture are different for each kingdom of nature and within each kingdom each individual establishes a very personal balance as well. In accordance with the picture presented by Lievegeod in ” The workings of the planets in the life processes of Man & Earth” I have placed the Cosmic Spirit sphere with the Galaxy, The Cosmic Astral sphere with its physical carrier the Solar System, The Cosmic Etheric sphere in its home the Earths Atmosphere, with the Earth naturally carrying the physical body. In nature there is no black and white. Any living process will intermingle at some point with its neighbour. So wherever these ‘physical’ dimension meet they crossover enabling an intermediate ‘space’ of reality to come into existence. So where the Etheric body enters into the physical sphere we have the development of the Biosphere. The minerals of the earth are lifted up by life processes – the Etheric body – into organic processes of Carbohydrate, Sugars and Protein formations. Similarly where the Solar System and the Earths Atmosphere meet we have the development of the electrically charged Ionosphere. Konig ( Earth & Man, Pg 89 ) shows how the Etheric ethers are manifest in bands of the Ionosphere. It is commonly accepted the elements of Fire Air Water and Earth are present predominantly in the Stratosphere, while the Gases of Hydrogen, Nitrogen Oxygen and Carbon (dioxide) exist in the proportions suitable for life only in the Troposphere. Within the Biosphere, these same four elements are the basis for organic chemistry. In this example we can see how the fourfold processes of the Etheric body organise themselves as different manifestations in each of these etheric layers. This diagram and others I hope to present in the coming issues of ‘Harvests’ are for your deliberation and are only a suggestion of could possibly be. I suggest you place them on a wall and have them as a continual reference as you grow in your understanding of Biodynamics. Little pieces continue to fall into place, piece by piece over time. In my experience Biodynamics is a physical science. It’s concepts are based on ‘physical’ realities and can be understood in a sequential common sense manner without the need to rely on faith, superstition or adhere to some abstract philosophy. It is a natural development out of sound Astronomical, physical scientific facts combined with an open lateral mind and imagination. 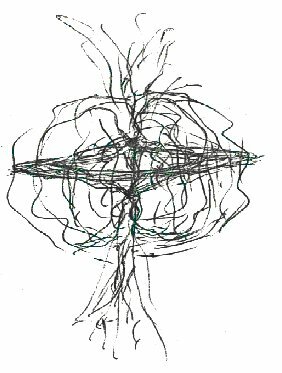 Creation is made up of a series of gyroscopic spinning ‘beings’, whose matter manifests on horizontal planes, while spinning around a vertical axis supported by two vortexes. ( see gyroscope – diagram 2 ) In fact Astronomy tells us space ‘matter’ is sucked down these vortexes into a black hole and squirted out along the horizontal planes we see manifest. From the Galaxy, to the Solar system, the Earth onto to the plant and the atom it is the same story. These ‘beings’, due to their spinning motion create massive electro magnetic fields. In the case of Stars their combustion creates electro magnetic rays as well. It is this electro magnetism of creation which holds everything in its present form and acts as one of the main conveyers of formative force and activity between all the different layers. The planets play a special role in this. They have very predictable paths and cycles of relationship with each other. Therefore as they move and alter the electro magnetic harmonics of our Solar System, at predictable moments, so manifestation alters accordingly. Hence the weather, plant sap flow and Human moods all move in a predictable dance orchestrated by the planets. As scary as this seems, my twenty years of observing these cycles has shown me beyond a doubt that this is so. An imagination I like of creation , is to see electro magnetism as the blood of creation while the Stars are its bones and the planets its flesh.